After the mix is light and fluffy place in a container with lid. 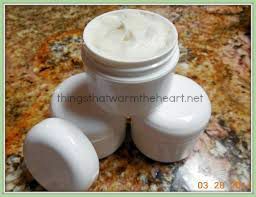 This is a base for a lot of creams I make. I just change the essential oils depending on what I am trying to achieve. I only use Young Living essential oils. This makes a great gift! I try to find small cut glass containers at thrift stores and garage sales, but they are hard to find. Baby food jars work nicely if you can find them. Otherwise you can purchase plastic ones here.